Brazilian architect Oscar Niemeyer brought the International Style to South America, transforming and elaborating upon the movement in the process. Known primarily for his work designing the major civic buildings in Brazils massive public works project of the late 50s: the creation of the new capital city of Brasilia, Niemeyer has had the opportunity over his life to establish an architectural language for an entire country, and influence the course of the worlds architecture in the process. Niemeyers version of Modernism shares the essential qualities of the eminent Le Corbusier and Mies, yet goes beyond the principles they established. The minimal steel-based structural systems, glass curtain walls, and clean lines that define the Modern and International Styles are a part of Niemeyers work, but additional qualities of cultural relevance and expression are also present. Le Corbusiers Villa Savoye from 1928-31 is surely the most paradigmatic example of early Modernism. While it is clearly still a formative work of the at-the-time-new language, I find that its elements lack the significance of Niemeyers forms. While thin piloties are used in both houses, the curvilinear forms that Corb uses are taken from industrial forms, and not artistic or geographical inspiration. The drawback of this is that Le Corbusiers forms are not tied to any one place or people, but only to technology. This style of building is only associated today with France because it was built there originally, not because it inherently contains an expression of the regions culture. 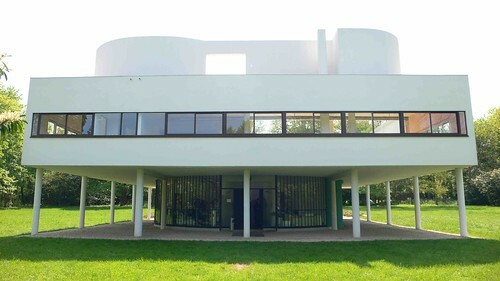 Le Corbusier's Villa Savoye. Photo credit to Flickr user End User. 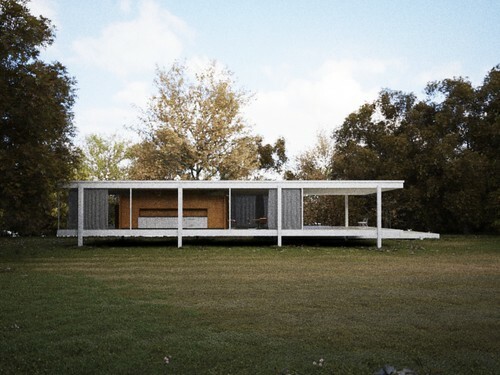 Likewise, Mies van der Rohes use of steel and glass in the Farnsworth House of 1945-51 is surely an exemplary expression of a mature Modernism, but not a very humanistic gesture. The ultimately minimal and clean refinement of space in this building is quite sublime, but the neutrality and generic quality of the angular forms does not engage the environment (social or geographic) that the building is situated in. In this case, the architect has chosen to relate to the site by intruding upon it as little as possible. However, the few necessary components that do exist are made so devoid of feature that they do not appear to exist in the same reality as the site. Mies van der Rohe's Farnsworth House. Photo credit to Peter Guthrie. Niemeyers house takes a similar approach to interacting with the environment, yet with a crucial difference. Where the Farnsworth House becomes as neutral and generic as possible to aviod conflict with the environment, the Niemeyer Houses minimal remaining elements take the forms of the surroundings. This immitation of the surrounding forms helps the house blend more effectively into the environment. Niemeyer actually went so far integrating his house with nature as to allow a gigantic rock to penetrate the houses membrane. 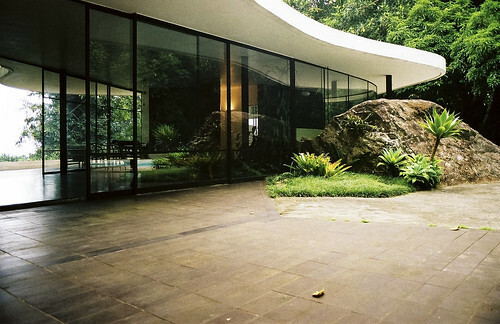 Oscar Niemeyer's Casa das Canoas. Photo Credit to Marina Moreira.